Parents ignoring SIDS risk to avoid flat head syndrome. Well-meaning parents are putting their babies at risk in order to avoid ‘flat head’ syndrome. They are kind, loving parents who only want the best for their child, but researchers have found what they are doing may be putting their baby’s lives in danger. A study, in Child: Care, Health and Development has revealed that new parents are ignoring guidelines designed to save lives and instead doing “anything” they can to treat what they believe is flattened head syndrome of their newborn including using pillows, dangerous home made devices while seeing unqualified experts who promise to fix their newborn’s skulls without proper qualifications. The condition, which affects around 20 per cent of babies, is called plagiocephaly, a skull deformation that can either be on one side of a baby’s head or the whole back of it. In extreme cases the flattened surface of the head may last for a lifetime if not prevented. Via Royal Children&apos;s Hospital Melbourne. Associate Professor Alexandra Martiniuk from The George Institute for Global Health at the University of Sydney studied families in Sydney and Canada after becoming worried about what she saw was an increasing number of parents ignoring SIDS (Sudden Infant Death Syndrome) guidelines in the quest to ‘fix’ their baby’s head. “Flat head is concerning for parents” Professor Martiniuk said “because it affects how their child’s looks - now and in the future. Some parents also believe that flat head affects their child’s development. Parents judge flat head as “a more real threat than cot death.” Image Stock. In an increasing trend in Australia Professor Martiniuk found when parents noticed a flat spot developing “they stopped following SIDS safe sleeping guidelines.” The study found that parents were “willing to do anything” to prevent plagiocephaly including using products or sleeping positions that are contraindicated under SIDS guidelines. Since the incredible success of the ‘Back to Sleep’ campaign – starting in 1992 - where babies are encouraged to be placed on their backs to sleep to reduce SIDS, the prevalence of positional skull deformation has risen ‘exponentially in developed countries’ say researchers. 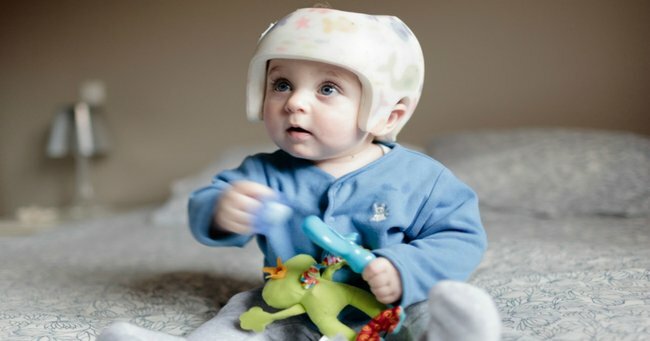 1-2% of babies are prescribed orthotic helmets.Via IStock. Flat head syndrome is now the most common reason for referral to many craniofacial centres - where in more severe cases of flattened head - about 1-2% of babies are prescribed orthotic helmets. Frighteningly the study found once either a concern or the discovery of a flat spot occurred, the majority of parents stopped adhering to all those guidelines they had diligently followed. Parents ignored the advice about not sleeping with any pillows, blankets, bumpers, lambs’ wool or toys in the sleeping area, avoiding devices that restrict baby’s head or movement – and instead they bought dangerous ‘pillows’ and devices or placed their infant in potentially dangerous sleeping positions - like on their tummy, or with their cot propped up with towels to treat their baby’s flat head . Even The Wiggles have embraced the sleep safe message. Post continues after video.. The study spoke with parents who believed it was okay to place a rolled up towel under the mattress to slant the mattress to one side, or put toys in the bed on one side hoping to get their infant to turn that way. Some parents said they believed that a hanging-style bassinet would prevent flat head – a view commonly shared on the internet and amongst siblings and mother’s groups. The majority of parents who were concerned about flattened head purchased various pillows, marketed as products to reduce flat head. Alarmingly, these pillows were often used from as early as four weeks. One mother said “We started using the pillow at 1 month and we’re still using it [at 17 months]." One way to help prevent flat head is by doing Tummy Time with your baby.Via Stock. Part of the blame was pointed at practitioners like chiropractors and osteopaths who sell these products. A selection of products parents may purchase.Via Facebook. Dr Martiniuk says there was an “urgent need” to educate parents. “We know that many parents are confused and fearful and are being given conflicting advice from health care professionals. She said that some GPs suggest parents wait and see if the condition improves on its own, while other GPs go down the path of referrals. Dr Martiniuk has urged professionals to maintain a “clear message” about how parents can safely prevent flat head syndrome from developing. “Parents should not to resort to using unsafe pillows. Although these pillows are marketed for flat head, there is no evidence that they work, and there is evidence they make the baby’s sleeping environment more dangerous,” she said. Alternate baby’s head position when you put your baby to sleep. Put baby to sleep at alternate ends of the cot or change the position of the cot in the room. Vary the carrying position of your baby. Alternate your arms or shoulders. Avoid laying baby on their back in car seats, bouncers or swings for prolonged periods of time (not more than 4 hours/day). Do Tummy Time with your baby. Keep trying Tummy Time – be persistent, even if they hate it, try a shorter time but more often.